Of course, when you think of the tallest mountain ever you’re going to probably think of Mount Everest with its peak of a little over 29,000 feet (5.5 miles). But when you look at Mt. Everest in comparison with some of the other mountains in our Solar System it won’t even make the list. 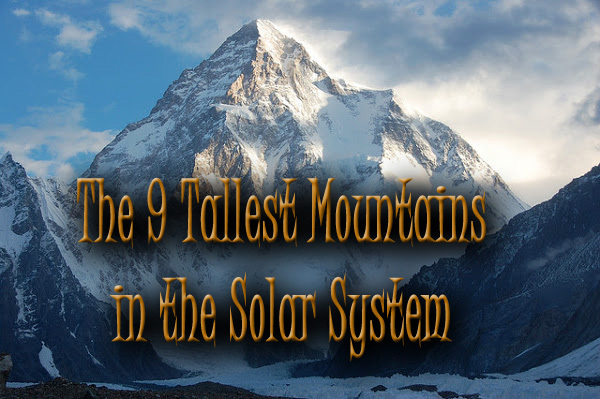 Let’s look at some of the Solar System’s tallest mountains as measured from the base to the peak. Arsia Mons on Mars has a diameter of 270 miles and from base to peak hits 12 miles high. Not only that but at the summit of this mountain the diameter is still 72 miles wide. of Mauna Loa in Hawaii. 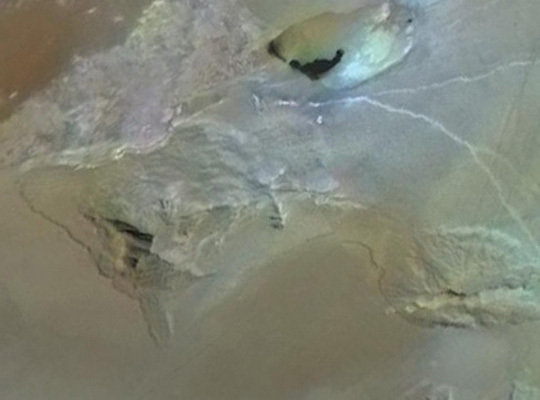 As of 2007, seven putative cave entrances, have been identified in satellite imagery of the flanks of Arsia Mons. They have been informally dubbed Dena, Chloë, Wendy, Annie, Abbey, Nikki, and Jeanne and resemble “skylights” formed by the collapse of lava tube ceilings. science-fiction novel ‘Ringclimber’ by Mark Chapman. Mauna Kea has an altitude of 2.6 miles but is actually 6.2 miles tall. Mauna Kea has an altitude of about 2.6 miles which is much lower than Mount Everest’s 5.5 miles. However, if you measure it from its base the entire mountain is actually 6.2 miles tall. Mauna Kea is actually an island and if you measured it from its base to it’s peak it’s actually tallerthan Mount Everest. Mauna Kea’s summit is actually one of the best places for observatories. The air surrounding the summit is extremely dry and stable. The peak is also above the inversion layer which means the could coverage is below the summit. The exceptionally dark skies at Mauna Kea’s summit is perfect for stargazing. At 6.8 miles high, Pavonis Mons is the the 7th largest mountain in the Solar System. Pavonis Mons is a large shield volcano located in the Tharsis region of the planet Mars and was discovered by Mariner 9 in 1971. Meaning “the peacock mountain,” it is a shield volcano and the height from the base to the peak is 6.8 miles. It has a very low slope that only averages about 4 degrees and at its summit there is a 3 mile deep caldera. Also, the Pavonis Mons is the site of the city of Sheffield in Kim Stanley Robinson’s Mars Trilogy of novels. Sheffield stands at the base of Mars’s space elevator. The 7.8 miles high Elysium Mons is similar to Earth’s Emi Koussi but 6 times higher. Elysium Mons was also discovered by the orbiting Mariner 9 but in 1972. It stands in the surrounding lava plains in Mars’ eastern hemisphere and has a diameter at its base of 149 miles. Hecates Tholus to the north, and Albor Tholus to the south. Elysium Mons resides on the Elysium Planitia and in 2005 a photo taken by the Mars Express spacecraft showed what could be ash-covered water ice. The ice is thought to be the remains of water floods from the Cerberus Fossae fissures about 2 to 10 million years ago. The InSight mission is expected to land on Elysium Planitia in September 2016. 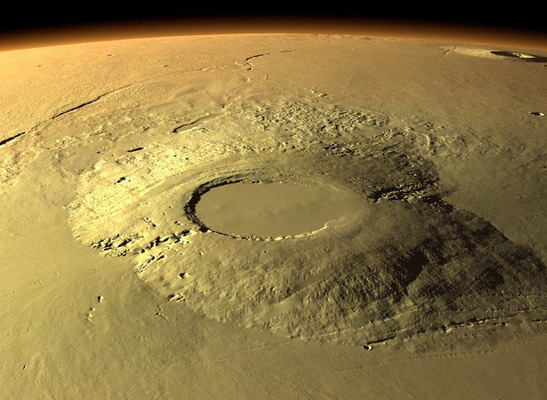 The shield volcano Ascraeus Mons, located in the Tharsis region of Mars, is the 5th largest mountain in our Solar System. At this point we know that Mars has a lot of very tall mountains. Ascraeus Mons is the second largest of all these Martian mountains listed reaching 9.3 miles from its base. This volcano’s low profile of just 7 degrees and is filled with volcanic vents. This results in a vast lava flow plain covered in a very fine dust. The original name of this mountain was “North Spot” because it was part of only 4 visible spots that could be seen due to a dust storm. When the dust cleared those four spots were then seen to be volcanoes. it is officially called, Ascraeus Mons. The 4th largest mountain in our Solar System lies on the northwest of the large Pele plume deposit of IO. We’ve seen that most of these tallest mountains are all volcanoes. Well, Boösaule Montes of IO is the largest non-volcanic mountain in our Solar System. It’s located on IO, the fourth largest and inner-most moon of Jupiter. From base to peak it reaches 10.6 miles and is just one of 150 discovered mountains on IO’s surface. IO also has over 400 active volcanoes. Boösaule Montes is just one of three mountains connected by a raised plane located on the Pele plume deposit. The mountain got its name from a cave in the Greek Mythology where Epaphus, son of Zeus, was born. Iapetus, one of Saturn’s many moons, contains the Equatorial Ridge with some peaks reaching over 12 miles high. Discovered by the Cassini spacecraft on December 31 2004, Iapetus’ Equatorial Ridge resides on Saturn’s third largest moon. This heavily cratered ridge has a history that is still debated upon. 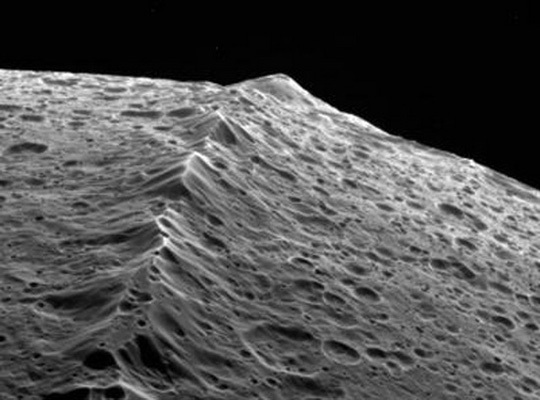 This ridge runs along the center of Iapetus’ hemisphere and contains some peaks that reach upwards of 12 miles high from the base. Iapetus is named after the Titan Iapetus, suggested by John Herschel that thought all of Saturn’s moons should be named after the Titans. There are several theories on the ridge’s formation: it could be caused by a previous ring system; it might have occurred due to an ancient convective turn; it could be composed of icy material pushed up from underneath, or it could be a result from when the moon was spinning more rapidly when it was younger. 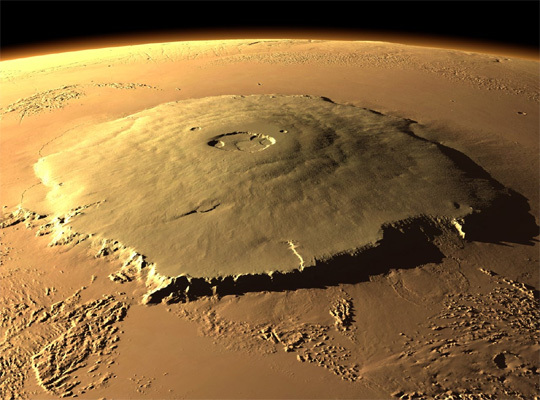 Olympus Mons on Mars is the tallest mountain on the planet and yet the youngest of the large mountains. 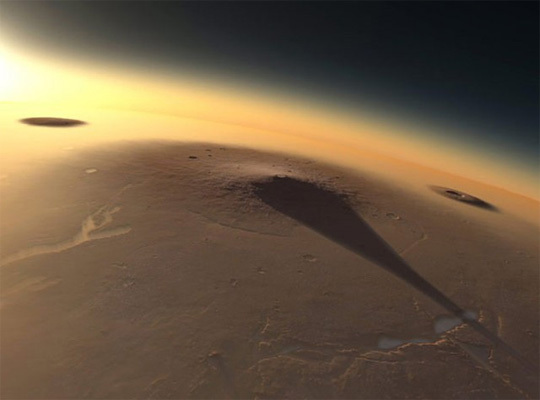 Olympus Mons is twice as tall as Earth’s Mount Everest. Olympus Mons’ elevation above the mean surface level is over 15 miles high, which males it the highest mountain in Solar System on that measure scale. However, its height above the surrounding planes makes it reach 13.7 miles from its base. Olympus Mons is the result of many thousands of highly fluid, basaltic lava flows that poured from volcanic vents over a long period of time. 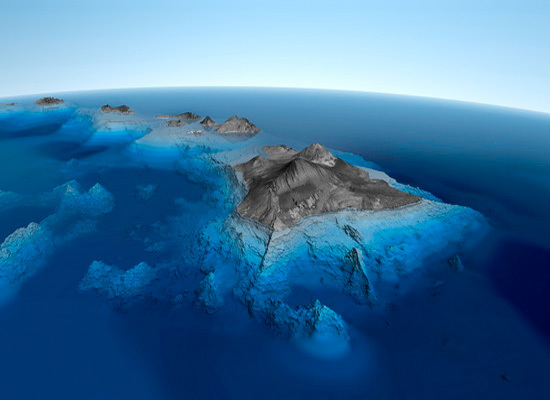 The size of a volcano’s caldera is a reflection of the size of the underlying magma chamber and Olympus Mons’ caldera has a depth of about 20 miles. 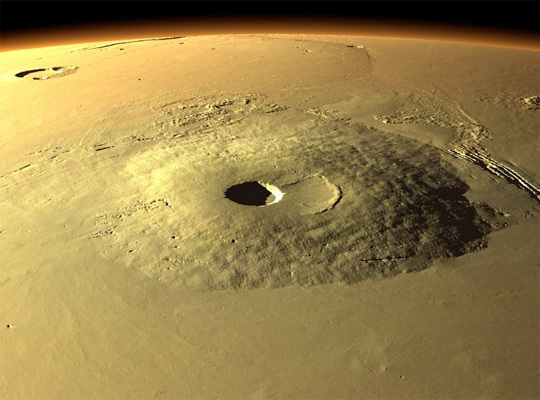 Olympus Mons covers an area the size of Arizona or about 114,000 square miles. 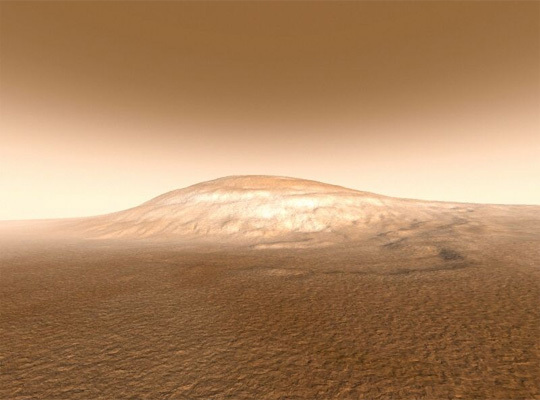 Because of its size and shallow slopes, an observer standing on the surface of Mars would be unable to notice that they’re standing in front of a volcano or see its entire profile. The curvature of the planet and size of the mountain go beyond the horizon and would obscure any full view. 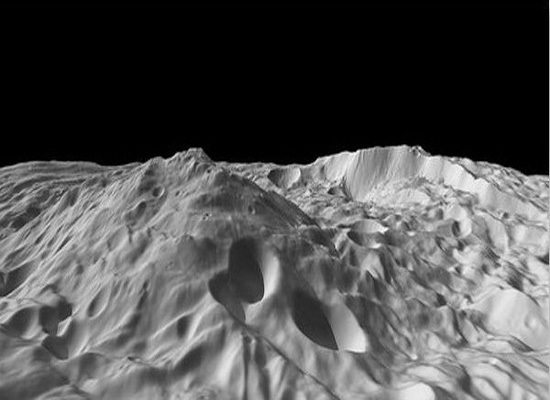 The largest mountain in our solar system, Rheasilvia, resides on the asteroid known as Vesta. Vesta is the second largest asteroid that orbits our Sun and Rheasilvia is its most prominent feature. Its 314 mile diameter makes up 90 percent of the asteroid’s surface. It is named after Rhea Silvia, a mythological mother of the founders of Rome and is believed to be an impact crater – one of the largest in the solar system. Rheasilvia rises 14.2 miles from it’s surface terrain basin from an impact collision that is believed to have excavated 1 percent of its volume. This impact is also believed to have created the Vesta family of asteroids. If research proves correct than the impact crater resulting in Rheasilvia’s formation dates back to over 1 billion years ago and would also be the origin of the HED meteorites. ← Simple Temperature Star Cookies For The Holidays! !